July on the South Coast. 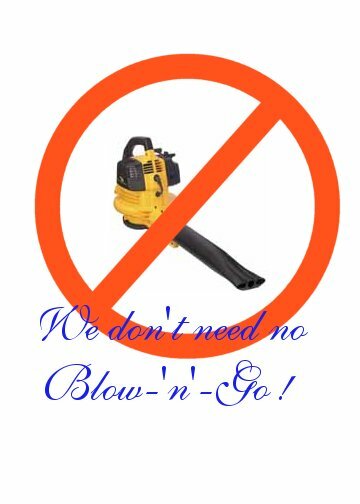 Your "gardener" has chain-sawed the flower buds off the flowering shrubs, and carefully removed all organic nutrients from the soil with leaf blower and rake. He'd rather undergo a root canal than pick up a hose to water a wilting plant. The driveway is nice and clean, though! Who's making your aesthetic and scientific judgments? Write to carolyn at this domain, and get a real garden! Joke of the year, reported by a new La Jollan client with a pair of 20-year-old double-flowering Hibiscus trees: "The gardener asked me if I want the Hibiscus to bloom. He said, ' It's so messy when it blooms. ' "
We use the term 'gardener' loosely. 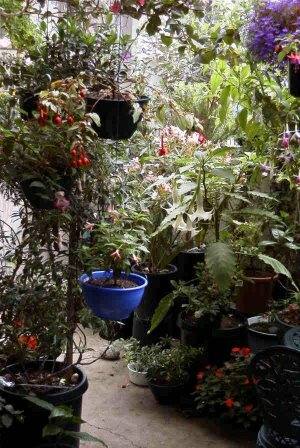 Take a peek at a garden I care for on a once-a-month basis. Just a little fish emulsion, compost, and paraffinic oil and the place goes wild. In these pictures, a tedious lawn, most notable for its skill at invading the flowerbeds, has just been replaced by a stone path and a sea of flowers. This courtyard is small; it's the depth and variety of colors, heights, and natural shapes that make it feel so much larger. 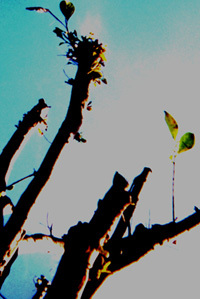 Finally, I've started my online Before and After portfolio. See how I hold up a dry slope, brighten up the dark, and bring life and color to the morning Torrey Pines Road commute (lucky drivers get gridlocked right in front of this garden). A Bit Of Earth, In Action! A Bit of Earth will happily design and install living flags or other patriotic patterns. 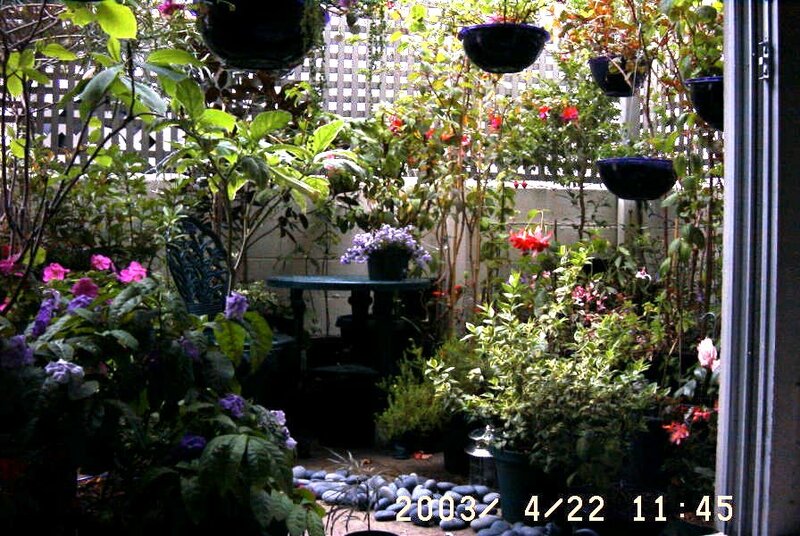 Now In Bloom On My Patio An unflinching and personally revealing look at a small La Jolla ecological system. The journal also contains reflections on life in La Jolla and wildlife, as well as notes for philosophical essays, book reviews, and more. The journaling software was designed and implemented by Carolyn, in perl. The Encyclopedia Botanica , 1999, Barnes and Noble. Despite having a pun for a title, this vast, serious tome is all business--and strikingly beautiful. Hedges, Topiaries, and Plants for Small Spaces : Thoughts on choosing shrubs to fit. Fluffy fuchsias flower furiously around the Princess Flower in August, but most of these are still in bloom now. Several are just coming into bloom again, including Winston Churchill, Nicci's Findling, and Flying Clouds. A nice overhead compliment to the winter camellia, tea tree, and azalea bloom. They're difficult to find in stores right now, but for those who scooped them up last March they're still coloring the landscape. In the picture below, left to right: Top Level: Dark Eyes, Guinevere, Golden Marinka, Dusky Rose; Second Row: Blue Satin, Jingle Bells; Bottom Level: Dollar Princess, Baby Blue Eyes, Southgate. 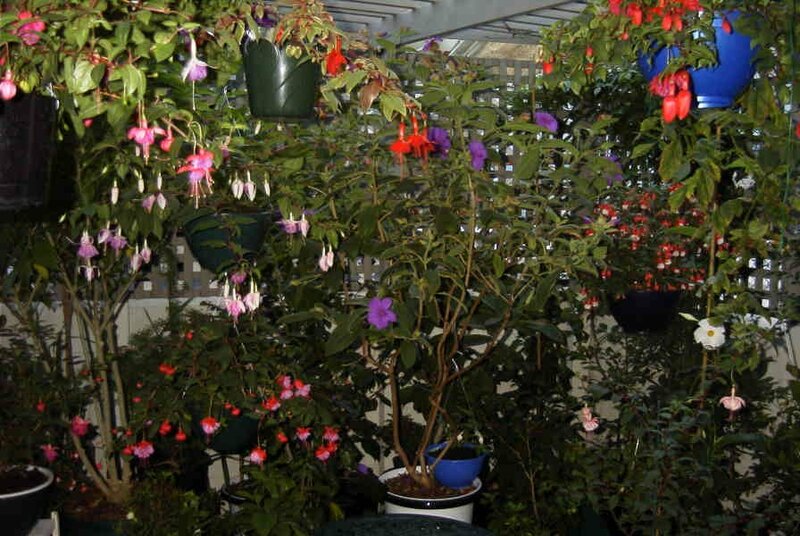 Other Plants: Center: Tibouchina (Princess Flower); Left: Cestrum Nocturnum (Night Blooming Jasmine, tree form); Right: Wisteria, Mandevillea. A Bit of Earth provides intelligent consulting, designs, and expert garden care to discriminating garden lovers in the southern coastal communities. Please write to carolyn at this domain for more information. He's just been so loyal to the house. He doesn't know anything, but he'll do whatever you tell him. He's the devil you know. He's so stupid, I don't know what he'd do without me. Who else am I going to get? Doesn't everyone have a gardener like this? This is the best you can really expect in Southern California. Raise your expectations! You deserve better.